The Congressional Review Act, 5 U.S.C. §§ 801-808, became law in 1996, and includes the Congressional Disapproval Procedure, 5 U.S.C. § 802. This statute gives Congress the power to rescind a regulation via a joint resolution for up to 60 days after promulgation. Prior to the Trump administration, Congress had used this procedure only once (Pub. L. No. 107-5, 115 Stat. 7 (Mar. 20, 2001) rescinded a Dept. of Labor ergonomics rule). Under the Trump administration, the Republican-majority Congress has used this procedure to rescind 14 regulations affecting students, teachers, the environment, workers, investors, and your right to privacy. That Congress disapproves the rule submitted by the [agency] relating to [final rule], and such rule shall have no force or effect. Disclosure of Payments by Resource Extraction Issuers, 81 Fed. Reg. 49,359 (July 27, 2016), submitted by the Securities and Exchange Commission. Rescinded by Pub. L. No. 115-4, 131 Stat. 9 (Feb. 14, 2017). Stream Protection Rule, 81 Fed. Reg. 93,066 (Dec. 20, 2016), submitted by the Office of Surface Mining Reclamation and Enforcement of the Department of the Interior. Rescinded by Pub. L. No. 115-5, 131 Stat. 10 (Feb. 16, 2017). Implementation of the NICS Improvement Amendments Act of 2007 (published at 81 Fed. Reg. 91,702 (Dec. 19, 2016), submitted by the Social Security Administration. Rescinded by Pub. L. No. 115-8, 131 Stat. 15 (Feb. 28, 2017). Federal Acquisition Regulation: Fair Pay and Safe Workplaces, 81 Fed. Reg. 58,562 (Aug. 25, 2016), submitted by the Department of Defense, the General Services Administration, and the National Aeronautics and Space Administration. Rescinded by Pub. L. No. 115-11, 131 Stat. 75 (Mar. 27, 2017). Resource Management Planning, 81 Fed. Reg. 89,580 (Dec. 12, 2016), submitted by the Bureau of Land Management of the Department of the Interior. Rescinded by Pub. L. No. 115-12, 131 Stat. 76 (Mar. 27, 2017). Elementary and Secondary Education Act of 1965, 81 Fed. Reg. 86,076 (Nov. 29, 2016) (relating to accountability and State plans), submitted by the Department of Education. Rescinded by Pub. L. No. 115-13, 131 Stat. 77 (Mar. 27, 2017). Teacher Preparation Issues, 81 Fed. Reg. 75,494 (Oct. 31, 2016), submitted by the Department of Education. Rescinded by Pub. L. No. 115-14, 131 Stat. 78 (Mar. 27, 2017). Federal-State Unemployment Compensation Program; Middle Class Tax Relief and Job Creation Act of 2012 Provision on Establishing Appropriate Occupations for Drug Testing of Unemployment Compensation Applicants, 81 Fed. Reg. 50,298 (Aug. 1, 2016), submitted by the Department of Labor. Rescinded by Pub. L. No. 17, 131 Stat. 81 (Mar. 31, 2017). Non-Subsistence Take of Wildlife, and Public Participation and Closure Procedures, on National Wildlife Refuges in Alaska, 81 Fed. Reg. 52,247 (Aug. 5, 2016), submitted by the Department of the Interior. Rescinded by Pub. L. No. 115-20, 131 Stat. 86 (Apr. 3, 2017). Clarification of Employer’s Continuing Obligation to Make and Maintain an Accurate Record of Each Recordable Injury and Illness, 81 Fed. Reg. 91,792 (Dec. 19, 2016), submitted by the Department of Labor. Rescinded by Pub. L. No. 115-21, 131 Stat. 87 (Apr. 3, 2017). Savings Arrangements Established by Qualified State Political Subdivisions for Non-Governmental Employees, 81 Fed. Reg. 92,639 (Dec. 20, 2016), submitted by the Department of Labor. Rescinded by Pub. L. No. 115-24, 131 Stat 90 (Apr. 13, 2017). Metropolitan Planning Organization Coordination and Planning Area Reform, 81 Fed. Reg. 93,448 (Dec. 20, 2016), submitted by the Federal Highway Administration and the Federal Transit Administration. Rescinded by Pub. L. No. 115-33, 131 Stat. 845 (May 12, 2017). Savings Arrangements Established by States for Non-Governmental Employees, 81 Fed. Reg. 59,464 (Aug. 30, 2016), submitted by the Department of Labor. Rescinded by Pub. L. No. 115-35, 131 Stat 848 (May 17, 2017). based [this rule] on public comments applying the privacy requirements of the Communications Act of 1934, as amended, to broadband Internet access service (BIAS) and other telecommunications services. In adopting these rules the Commission implements the statutory requirement that telecommunications carriers protect the confidentiality of customer proprietary information. The privacy framework in these rules focuses on transparency, choice, and data security, and provides heightened protection for sensitive customer information, consistent with customer expectations. Congress disapproves the rule submitted by the Federal Communications Commission relating to ‘Protecting the Privacy of Customers of Broadband and Other Telecommunications Services’ (81 Fed. Reg. 87274 (December 2, 2016)), and such rule shall have no force or effect. Tor Browser (the most private of all, but it does slow down your computer). 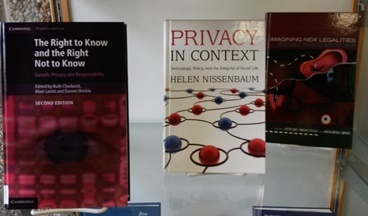 Display of books on privacy. Stop by and see the display of books near the entrance to the Library relevant to the right of privacy. Thanks to Alyson Carney for assembling this timely display. Agency Final Rules Submitted on or After June 13, 2016, May Be Subject to Disapproval by the 115th Congress (CRS Insight, Dec. 15, 2016). Congressional Review Act: Disapproval of Rules in a Subsequent Session of Congress (CRS Report, Sept. 3, 2008). Note, The Mysteries of the Congressional Review Act, 122 Harv. L. Rev. 2162 (2009). What Is the Effect of Enacting a Congressional Review Act Resolution of Disapproval? (CRS Insight, Mar. 3, 2017). Jeff Dunn, Trump Just Killed Obama’s Internet-Privacy Rules — Here’s What That Means for You, Business Insider, Apr. 4, 2017. Brian Naylor, Congress Overturns Internet Privacy Regulation, NPR, Mar. 28, 2017. Aaron Pressman, What Really Happens When the FCC’s Online Privacy Rules Are Cancelled, Fortune, Apr. 3, 2017.